Apple's Maps app can be a valuable navigation tool. Here's everything you need to know about it! Whether you just need directions or are hopelessly lost, Apple's Maps app is right there on your iPhone to help you out. The official Maps app can help you find the exact place you're looking for, such as a restaurant, a friend's house, or an airport. You can get directions to all of these places, including driving, walking, and mass transit directions. With more recent additions, you can even see indoor maps of facilities such as airports. What's new with Apple Maps? Check back here for the latest updates in Maps news. As first noted by MacRumors, Apple has rolled out its indoor maps for several malls across Canada, making it easier for iPhone owners to find the exact locations of the stores they're looking for. Most of the malls in question are owned by Cadillac Fairview. Yup: Apple is finally going to be building all maps using the company's own data. Okay, okay. I say finally, but really, Apple has been collecting first-party data for its maps for the past four or so years. Back in 2015, Apple began collecting map data from a combo of sources at its disposal: dedicated Apple Maps vans outfitted with GPS rigs, LiDAR arrays, cameras that shoot overlapping high-resolution images, Macs, iPads, and physical measuring tools; high-resolution imagery captured using satellites; "probe data" from iOS devices; and hundreds of human editors. Since we introduced this six years ago — we won't rehash all the issues we've had when we introduced it — we've done a huge investment in getting the map up to par. When we launched, a lot of it was all about directions and getting to a certain place. Finding the place and getting directions to that place. We've done a huge investment of making millions of changes, adding millions of locations, updating the map and changing the map more frequently. All of those things over the past six years. [But] we wanted to take this to the next level ...That is building all of our own map data from the ground up. The truth is that Maps needs to be [updated more], and even are today. We'll be doing this even more with our new maps, [with] the ability to change the map real-time and often. We do that every day today. This is expanding us to allow us to do it across everything in the map. Today, there are certain things that take longer to change. For example, a road network is something that takes a much longer time to change currently. In the new map infrastructure, we can change that relatively quickly. If a new road opens up, immediately we can see that and make that change very, very quickly around it. It's much, much more rapid to do changes in the new map environment. In the revamped Maps, depending on the context of your trip, the app will now show more detailed graphics, including things like foliage, swimming pools, sporting areas, and sidewalks. As Panzarino mentions, Apple has always had a knack for marrying the utilitarian with the artistic. Thanks to a team of cartographers (yes, cartographers), the new version of Maps will be even more beautiful and useful than ever before, helping your brain more intuitively make sense of what's going on geographically. This is the department of details. They've reconstructed replicas of hundreds of actual road signs to make sure that the shield on your navigation screen matches the one you're seeing on the highway road sign. When it comes to public transport, Apple licensed all of the type faces that you see on your favorite subway systems, like Helvetica for NYC. And the line numbers are in the exact same order that you're going to see them on the platform signs. It's all about reducing the cognitive load that it takes to translate the physical world you have to navigate through into the digital world represented by Maps. Sounds pretty cool if you ask me*. *Someone who struggles desperately to make sense of any sort of map at all. If the phrase "probe data" frightened you, worry not: Apple is still adamant as ever about protecting user privacy. Probe data is, according to Panzarino, "essentially little slices of vector data that represent direction and speed transmitted back to Apple completely anonymized with no way to tie it to a specific user or even any given trip. It's reaching in and sipping a tiny amount of data from millions of users instead, giving it a holistic, real-time picture without compromising user privacy." So Apple isn't tracking every step of your trips from beginning to end. Instead, the company is only collecting teeny tiny slivers of location data from tons of different trips completely anonymously in order to form a cohesive picture. The new Maps will be rolling out to the US first, launching in San Francisco and the Bay Area of California with the next iOS 12 beta next week. It will cover Northern California by this fall, and will eventually be rolled out to every version of iOS over the course of about a year. For a more in-depth preview of upgraded Maps, check out Panzarino's full piece here. March 29, 2018: Find gender-neutral restrooms using Maps! If you're not already checking the "Useful to Know" section when you search a location in Maps, you absolutely should be. It's full of handy information that can help you plan your day out and about, especially if you're traveling or visiting somewhere new. It includes whether or not a place accepts Apple Pay, if you can make reservations there, if it's kid-friendly, and, most importantly to some, whether or not it has gender-neutral restrooms. To view the "Useful to Know" section, all you need to do is do a quick search for whatever establishment you're curious about, then tap on it in the suggestions that appear below your map. You may need to scroll down a bit to see it — it's underneath the location's phone number. Though there are already dedicated apps out there for finding gender-neutral restrooms for transgender and gender-nonconforming individuals — the incredible Refuge Restrooms comes to mind — it's really heartening to see this information being displayed in the native Maps app. And yes, I hear what you're saying: Shouldn't every public place have a gender-neutral restroom option to provide a safe and welcoming space for everyone, regardless of how they identify? Absolutely yes. However, until that day comes, it's nice to know what to expect when you're going out for drinks with your friends or taking your family for ice cream. Looking for an alternative form of public transit that doubles as a workout? If you don't have a ride of your own, you'll now be able to view nearby places in your city where you can rent bikes within the Maps app so you can get where you need to go. According to a report by TechCrunch, Apple has signed a partnership with public transit data company Ito World, integrating bike-sharing service data into Apple Maps in more than 175 cities across 36 countries. The feature is currently live and incredibly easy to use. All you need to do is search "Bike Sharing" in the search bar that appears when you launch the Maps app. Or, if you already use bike-sharing regularly, you can type in the name of your favorite service instead, and Maps will tell you if there are any stations nearby. It will also provide contact information for the service. Though Apple had already added some bike-sharing services to maps in a handful of cities prior to now, integrating Ito World's existing bike-sharing data allowed Apple to make the feature available more quickly than doing all the collection in-house. And, as TechCrunch notes, "Ito World has worked with dozens of companies to license and normalize bike-sharing data. This way, Apple only has to integrate one data model to support hundreds of bike-sharing services." Unfortunately, as TechCrunch also mentions, Maps doesn't currently show how many bikes there actually are at a station or if there are any available bike docks. Hopefully, that feature will be added soon, as more specifically-dedicated bike-sharing apps already have it. For a full list of supported services, you can check out TechCrunch's article here. Apple announced indoor maps for places like airports and shopping malls as part of iOS 11 and the company has just now expanded the feature to include 30 more airports in the U.S. and around the world. With indoor maps, you can see things like security checkpoints, food courts, and most importantly to me — coffee shops! The detail level is great, as is the seamless way you can zoom out from regular maps and into the detail view inside. Sadly, my local Trudeau airport in Montreal (YUL) hasn't been added yet, but I just happen to be at LGA right now and, in my quick tests, it's working a treat. You can tap to switch between departure and arrival levels, for example, and use nearby to find shops, snacks, and more. Airports, especially when you're rushing for flights or facing weather delays, can be beyond stressful. Indoor maps take the edge off that stress and help you not only find where you need to go, but places you want to check out while you're waiting to go. Apple put in a lot of extra effort as well, traversing every airport, making sure dead zones were covered and walls and doors were accurately placed. 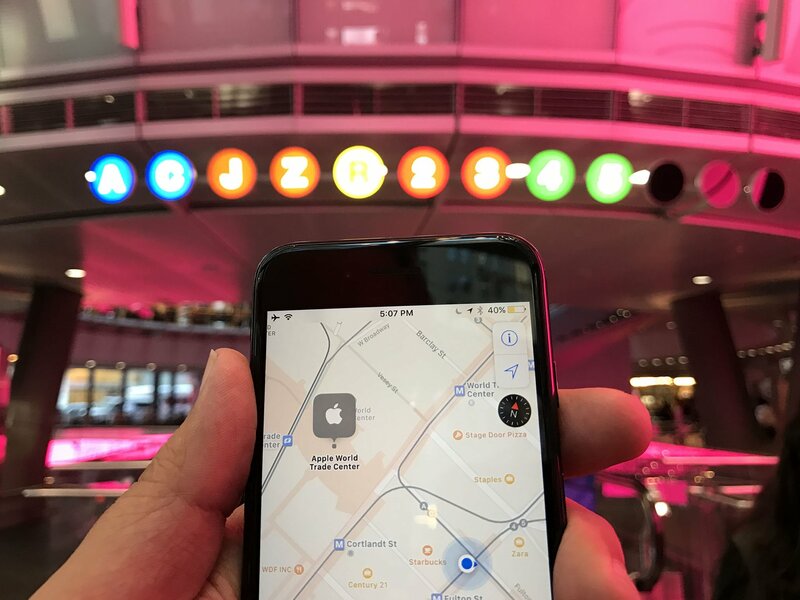 If you live in a city where Apple's indoor maps for airports just went live, check 'em out and let us know what you think. Apple Maps has lagged behind its competitors for a few years — in part because Apple was late to the game. But over the last year, it's become a more stable, usable service. iOS 10 continues that trend, bringing huge (and much-needed) software and server-side improvements to Apple's mapping application. Apple Maps has embraced the San Francisco bold look head-on, with clear, readable maps labels, bright colors, and crisp text. The top and bottom navigational bars have disappeared entirely, replaced by contextual cards and a small overlay for further information, GPS location, and the weather. Though you get more visual overhead as you use more complicated Maps options, the general focus seems to have been on keeping it light, clean, and understandable. On launch, the bottom card will display a search bar along with predictive locations (based on your routine or Calendar appointments) and favorite or recent locations. As will soon become custom, you can scroll up on this card to get an expanded list, as well as full access to your Favorites list. Tap on an address or pin, and that contextual card changes, offering you an address, estimated mileage and driving time, and — if it's a public business — Yelp-sourced information on the business's hours, photos, website, menu, and the like. (You can tap any of these to go directly to Yelp for more information.) You can even tap on yourself to either mark your current location with a pin, or share it with your friends. Where Apple Maps has really branched out is in its search: Though it still pulls primarily from Yelp's database, it's become a lot easier to find and narrow down options for food, entertainment, travel, gas, and more. When you tap on the search bar, eight brightly-colored bubbles appear to whisk you off to the business of your choosing: Food, Drinks, Shopping, Travel, Services, Fun, Health, or Transport. Tap on one bubble, and you go further down the rabbit hole into a sub-genre of options: Food, for example, offers up a Popular section, along with Restaurants, Groceries, Fast Food, Coffee Shops, Bakeries, and Desserts. Let's get this out of the way: Maps's server-side directions still need some work. Over the past few months, I've been running it on all my short- and long-haul trips simultaneously with Google Maps, and while it generally keeps up quite well, there are still some holes in its computations. (Notably when traffic is involved, or trying to branch off the well-worn path through slightly more obscure street routes.) It's miles better than Maps's initial server woes, and largely only when driving routes are involved: I actually quite prefer Apple's transit data to Google Maps. But the caveat needs to be stated, and so it has been. That aside, Maps now has one of the best interfaces for directions out there. The new bold, bright look is great for quick-glance information when in the car, and both Siri and large buttons help keep your attention on the road as much as possible rather than yelling at your directions-providing device. Outside the interface, Maps fixes a niggle I've had since version 1.0: It now lets you zoom to any point on the map with a multitouch pinch gesture, as well as view a full overview of the route. When turn-by-turn is enabled, you can also search along your route for local food, gas, or coffee options by tapping a few big buttons; you can also just ask Siri "Is there a coffee place nearby?" and Maps will present options and automatically add a stop to your route if you so desire. It works just as well (if not better) than Google's implementation — having Yelp data and rankings to draw on is a welcome addition to the sometimes-stressful job of picking road trip stops. When you're planning your routes, Maps offers multiple options, like most major mapping services; Apple has also now incorporated switches that let you avoid tolls or highways — a big deal for metropolitan folk — and transit options that let you exclude certain methods of transportation in favor of others (turning off bus routes, for example, if all you want to see are train schedules). Hands down, my favorite Maps feature in iOS 10 is Apple's new "Parked Car" marker. If your vehicle has either CarPlay or Bluetooth connectivity, your iPhone will recognize where it last chatted with your car, and mark it in the Maps app. Not only that: It'll tell you when you last parked (so that you can accurately monitor meters), and offers a notes field where you can add a photo (of your parking garage number) or different notes. I have used this feature pretty much daily since installing iOS 10, and my forgetful parking lot self can't really imagine life without it. Maps is one of Apple's test-case apps that supports third-party embedded extensions: Though not as expansive as, say, Messages, Maps will let you book reservations and rideshares directly through the app — even from the directions screen. It's clearly a very limited concept at launch (there aren't that many rideshare services, period), but as with Apple's other embedded app experiments, this could snowball very quickly if it proves successful. I'd love to be able to embed Carrot Weather in place of the fixed weather widget, for example. If you're wondering exactly how to do a particular thing in the Maps app, you'll want to check out our ultimate guide. It covers the gamut of actions you can take with the app, from viewing and sharing your location to filing a troubleshooting report. Maps offers transit directions to an ever-expanding list of cities across the world. These directions allow you to find trains, buses, ferries, and other means of mass transit near you, and which routes will most efficiently get you to your destination. Apple Maps and transit directions: Which cities have them? Problems crop up with every piece of software, but for Maps, that could mean everything from a bad turn-by-turn instruction to being given a completely nonsensical route. With Maps' built-in tools, you can report a variety of problems to Apple directly in the app. If you have any questions about the Apple Maps app, let us know in the comments.